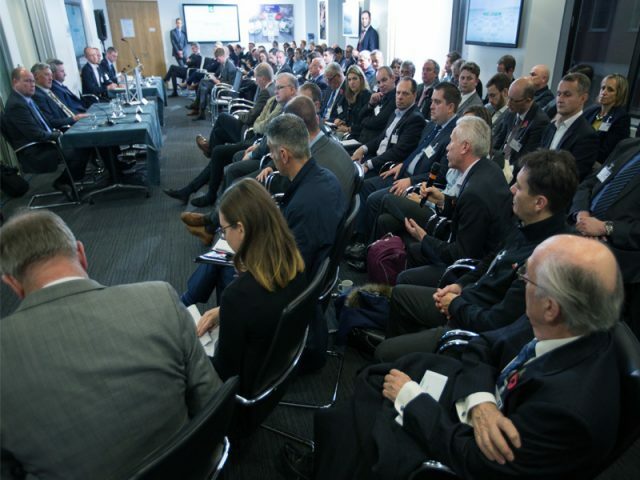 Go Ultra Low’s second annual Summit took place on 7 November at the SMMT in London, and saw representatives of project partners, Go Ultra Low companies and interested parties share their experiences with ULEVs and debate concerns surrounding the UK’s current market and charging infrastructure. According to Society of Motor Manufacturers and Traders (SMMT) data shared by chief executive Mike Hakes at the Summit, demand for electric vehicles and plug-in hybrids in particular has increased “significantly” in 2016; with more than 30,000 registered to-date, representing a 39% increase over 2015. Just over 60% of those vehicles are registered to fleets. Public and private sector organisations that already use EVs, or offer them to employees as company cars, are eligible for Go Ultra Low Company status, providing there’s a commitment for EVs to make up at least 5% of their vehicle fleet by 2020. Will Smith, senior reward and performance manager at Britvic, shared details about how his fleet has adapted since becoming a Go Ultra Low Company. Fuel costs across the entire fleet of almost 400 cars and 100 vans have dropped by 9% since January 2016, with a CO2 average of 104g/km for the fleet. 11% of Britvic fleet vehicles are now ULEVs, equating to almost 50 vehicles. Smith reported that employee feedback has been positive and end of life costs have halved, assisted by employees taking more care with the high-spec plug-in hybrid vehicles. Uptake of fleet is also up 10% over cash allowances, particularly at the senior end where access to plug-in hybrid SUVs is permitted, and Britvic’s board of directors all drive Teslas to set a precedent for the use of ULEVs. Smith also revealed that running the fleet is now 20% cheaper than it was two years ago, from a total cost perspective. While initial outlay for rental is higher due to the targeting of premium vehicles, he claims the company tax bill had dropped “significantly” since the introduction of ULEVs, as have damage claims, accident rates and fuel costs, leading to an overall saving. The Summit also provided the opportunity for a Q&A session directed to a panel of experts. Discussion topics included the raising of awareness of ULEVs, how to combat ‘bay hogging’ behaviours and the ongoing problem of charging units not being properly maintained. Chair Bob Moran, deputy head of Office of Low Emissions, asked the panel if there is still reluctance in some circles to offer ULEVs to employees, and how this can be overcome. “We’ve had an initial period where people were concerned about the capabilities of the vehicles, and I think we’ve passed that now,” said Chris Chandler, principal consultant at Lex Autolease. “We’re in a position where the early adopters who felt like they were taking a risk now feel comfortable with the technology – that fear of the unknown and change has been quietened. Where we are seeing the greatest successes for our customers using electric vehicles is where the policy has really been thought out and implemented correctly. “Clearly electric vehicles in their current form are not going to work for every driver in every situation, so it’s all about identifying the sweet spots and making sure the vehicles fit the role and journey types they are assigned to, and drivers are fully educated on the benefits and restrictions of using EVs,” he added. John Hayes, Minister of State (Department for Transport) speaking at the Summit. Charging infrastructure was a key discussion topic, with audience members detailing a number of specific incidents where charging points have been out of order for an extended period of time, particularly at motorway service stations. “It is certainly true that there were issues in some markets when commercial service operations were dropped, meaning that no one was looking after some of the older generation units – London had a particular issue with that when early contracts ended,” responded Robert Evans, chair, UK Electric Vehicle Supply Equipment Association. “If you look at any of the EV charging location maps now though, you will see that there is generally a very high level of availability and reliability. In the early days there were issues with the longevity of charging points – this industry has come together really quickly and the technology has been rapidly overtaken by new developments. The new technology is highly reliable – we now have remote reset capabilities, for example. “We take reliability of the charging units seriously because it damages the reputation of the sector if a driver arrives at a charging point and it is not operational, and it is absolutely a priority of the sector to maintain availability for customers,” he said. “As an industry, we are still working towards a situation where the charging infrastructure is the same right across the country – there are a couple of major players now that cover most areas so it’s not quite as fractured as it was five or six years ago, but we’re not quite there yet,” agreed Karl Anders, national EV manager, Nissan. ‘Bay hogging’ was raised as an issue in the workplace, with spaces either being filled by vehicles after the charging session has finished, or by non-EV or hybrid vehicles. Smith suggested the use of a bay booking system to help ULEV drivers feel confident they will be able to get a charge at work during their four-hour slot. Concerns about some businesses taking plug-in hybrids for the ‘wrong reasons’, specifically tax-reduction purposes, were also raised. A proposal to review how often the plug-in hybrid is charged as part of the MOT process was met with enthusiasm, with the idea being that if a plug-in vehicle is found to be being driven purely on the combustion engine, the driver will be required to pay back some of the tax that was initially deducted. Future technologies such as autonomous electric vehicles and wireless charging were also addressed, with a general consensus that the technology will continue to develop at a rapid rate. “It’s fascinating, we’re coming into a really exciting period over the next 5-10 years for product development,” said Chandler. 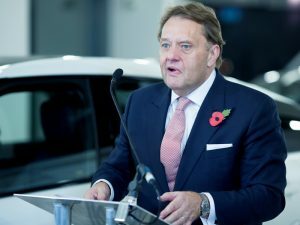 Minister of State for the Department of Transport, John Hayes, closed the session with a short statement affirming the government’s intent to continue to support uptake of electric and plug-hybrid vehicles by UK business and private drivers. “We want more people to have and use electric cars. We’ll do all we can as government to support this,” he said.